Linux and BSD as well. I guess nobody counts the Juniper/cisco routers that power the whole internet. Juniper uses FreeBSD, and cisco uses both parts of FreeBSD and OpenBSD. http://www.cisco.com/en/US/docs/cable/serv_exch/serv_control/broadband_app/rel38x/swcfg8000_gbe/AppendixC_license.html (Search for OpenBSD or Damien Miller). It is legitimately interesting to see the platform distribution numbers move up and down. Of course any market share comparison of >5 years automatically becomes a comparison between apples and oranges and walnuts. I enjoy these kind of debates because it involves trying to over-simplify vast, complex ecosystems into an A vs. B competition. I can grok over-simplified arguments and they also make for good headlines, but they are, of course, too shallow to explain the true dynamics at work. They’re more comical than case study. To predict the future market share breakdown of operating systems, you can’t use the public discourse that generates all of the media attention: platform purity, robustness & merit of feature set, freedom vs. greed, righteousness, loyalty and the most artificially persuasive emotion of them all: hatred.. Anyway, the problem I have with this post is that it perpetuates revisionist history explanations despite their lack of completeness and lack of truth. 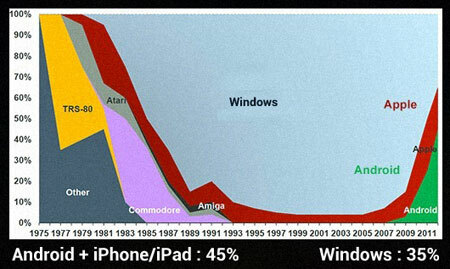 “When Microsoft Windows became popular at the end of the ’90s,” — this is not a true premise, as shown by the graph directly above this statement. “Microsoft crushed all their opponents by abusing their position of dominance and resorting to anti-competitive practices.” — this is an incredibly shallow and incomplete recollection of the times. First off Microsoft did not crush all of its opponents — certainly not when it comes to operating systems. Microsoft’s mission was to have a PC in every home and on every desk running Microsoft software. It was the success of this mission that open the door for thousands of companies to innovate, including Google & Apple. Second, Microsoft and Apple settled their court cases when Mac market share was at a very low level but the only profitable software running on the platform was Microsoft Office. So in a sense, the $100m Microsoft gave Apple helped allow them to survive long enough for Jobs to rework the company and allowed them to create the game changing iPod. It was Windows’ ubiquity that allowed Apple’s revenues to skyrocket without having to worry about selling a computer to the user first. Laws couldn’t get Microsoft to behave? This is actually a silly argument, despite how much you hate Bill Gates or Windows. 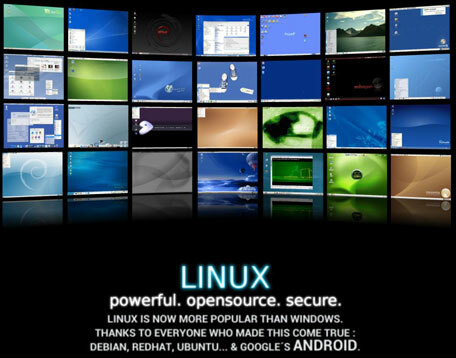 Yes, Linux has had a profound impact on the landscape of desktop and server operating systems. Did you know that Microsoft released Internet Explorer 3 for Solaris? Did you know that Microsoft continues to publish more of its code than nearly all other companies combined? Did you know that Apple sued the Polish supermarket A.pl for copyright infringement? Did you know that the majority of Ubuntu’s user interface standards are taken from the Windows published guidelines? – What percentage of software developers only right software for Linux? – How many companies have made a billion dollars because of Apple? – How many users have saved thousands of dollars because of Linux? Almost none is the answer to all 3 questions. Are you actually making the argument that Microsoft prevented innovation? That’s contrary to your statement that the iPod was revolutionary. There are so many vectors of frustration tickled by Microsoft bashing that it’s hard to compose a coherent comment that is worth of further discussion. I’m exhausted already and I’m legitimately trying to stimulate conversation. However I fully realize that I am likely to fail. I am sorry about this. I still enjoyed reading your post. Thanks for your interesting comment, Timmy.